The weather forecast on the 7 o’clock news wasn’t promising. Clouds and rain marks filled a large swath of eastern Hokkaido. 8 lucky souls gathered around the TV in the Kiyosato hut, overlooking the trailhead of tomorrow’s target peak – #93 in my 100 mountain mission. Dawn revealed an overcast sky as I ditched my heavy pack in lieu of a much lighter bum bag. The trail cut through a dense forest before quickly dropping to an old, gravel forest road. At the end of this road once stood the original hut whose owner, as legend has it, succumbed to a lethal Japanese hornet sting. 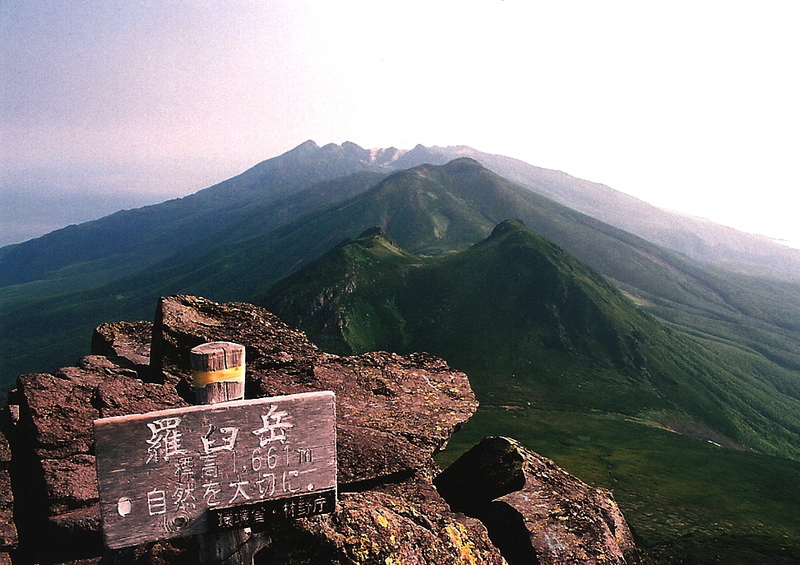 Not even the slightest trace remains of what was reportedly one of the best mountain huts in Hokkaido. 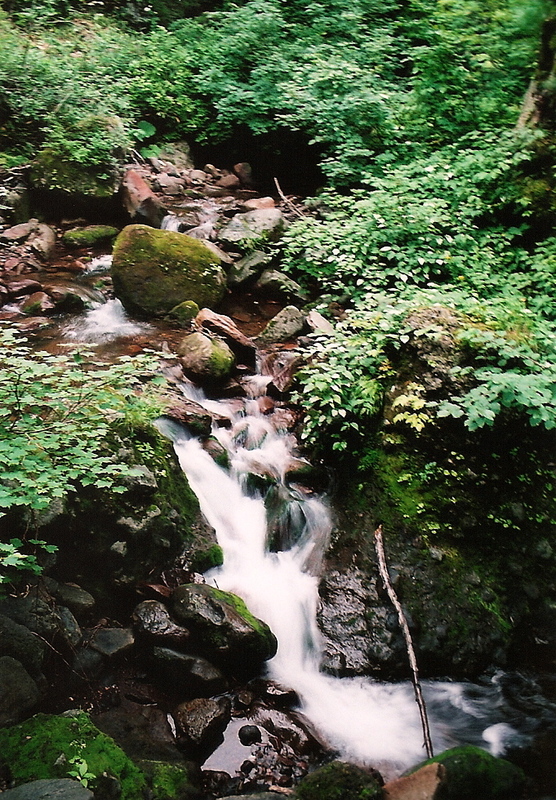 I took a deep breath and stepped back into the forest, following a beautiful mountain stream. 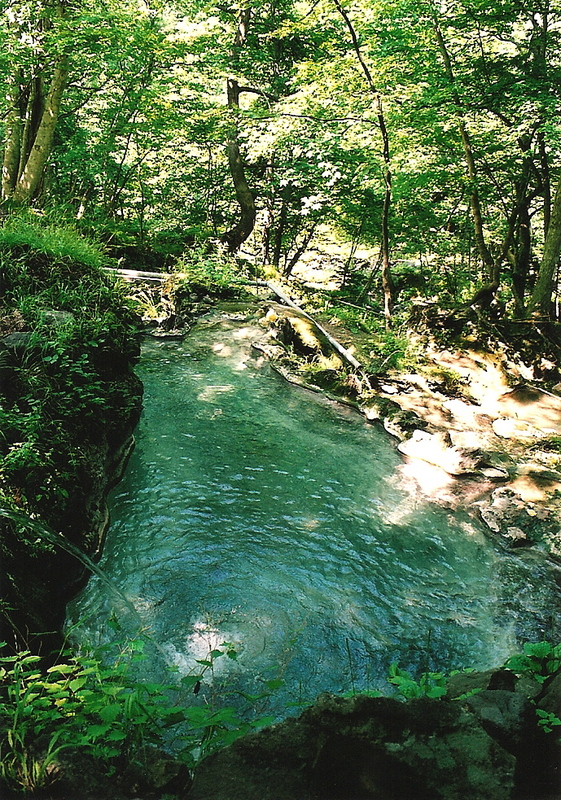 The path crisscrossed the water a dozen times before climbing straight up the side of a waterfall. Miraculously, the rain held out for the time being, but the cloud sure was thick. My greatest fear would be getting caught in a torrential downpour and unable to descend because of a swollen river. Fingers remained crossed for most of the remainder of the climb. 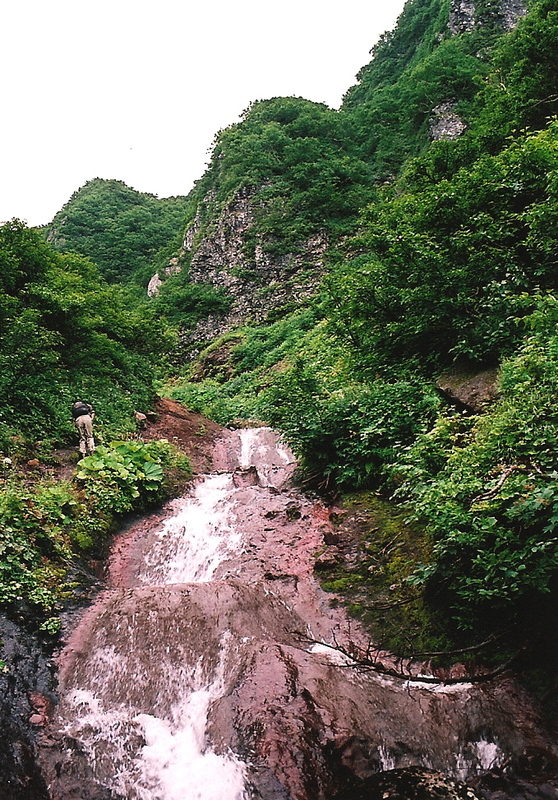 Eventually, the stream petered out to a trickle and I found myself scaling up a massive volcanic bowl which must surely be an avalanche death trap in the winter. 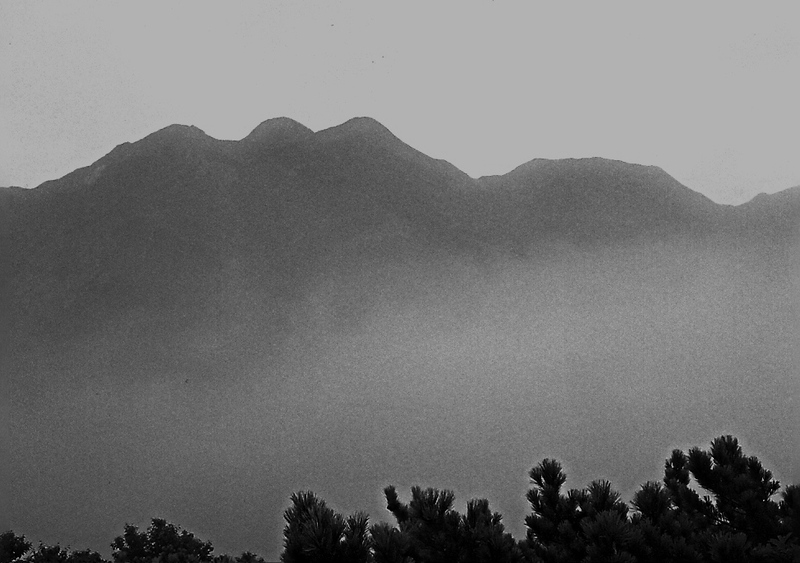 All around me the peaks rose, hovering above the thick mist below. 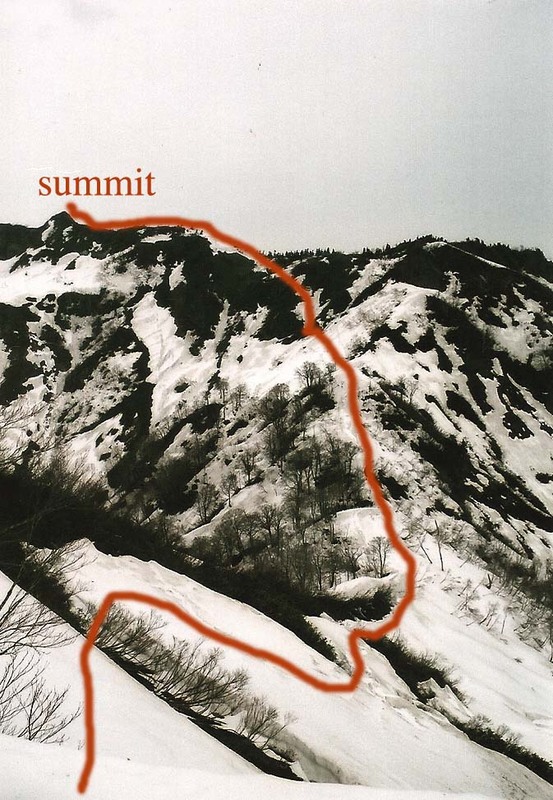 I reached the ridge, turned left, and saw the summit directly to my right. A steep climb, a drop to a saddle, and another quick scramble lie before me. The wind picked up and the clouds started slowly rising from the valley below. Fearing a proof shot without a view, I quickened my pace, popping out on the summit shortly before the clouds engulfed everything around me. Retracing my steps to the bowl, I decide to descend via the newer path that bypasses the waterfalls. 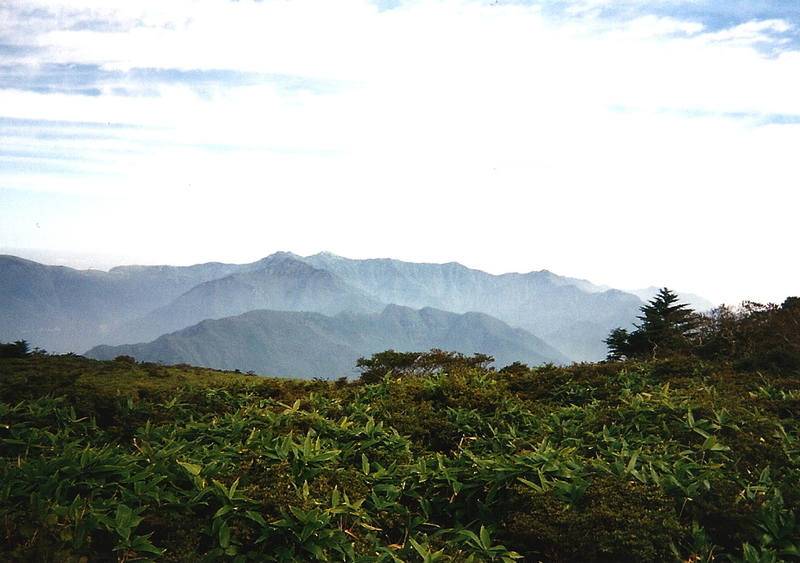 I climb up an adjacent spur, swimming through brush pine, strong cool winds, and thick mist that brought images of the Japan Alps to mind. You see, virtually every peak in Japan looks the same in the right weather conditions. 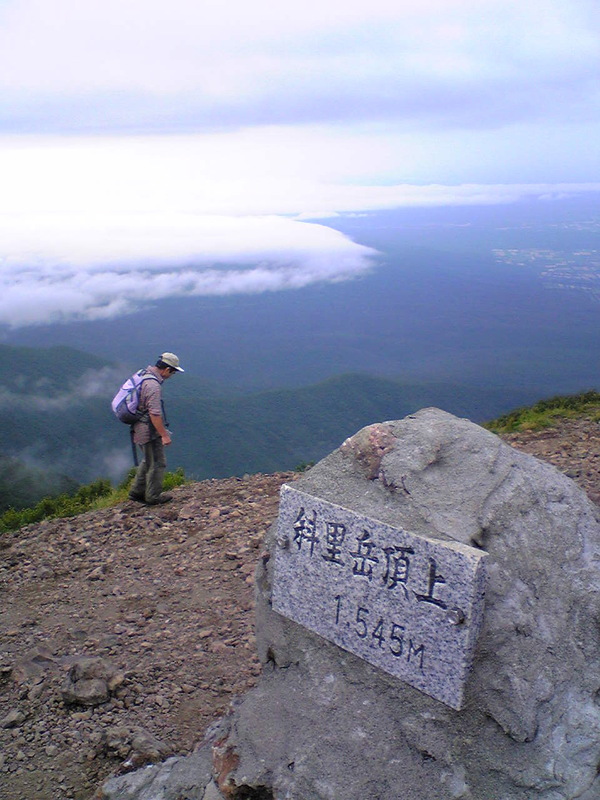 Hiking through the mist in Nagano is no different from battling the clouds on the northern island. I should know, after trekking through nearly 70km of exactly the same scenery a few years prior on a journey from Kamikochi to Tateyama. Still, I’ll trade a monotonous day working in an office any day for a fog-laden stroll through virgin flora. In the end, the rain never really materialized more than a heavy drizzle, and my thoughts of swimming my way back to civilization remained a hypothetical scenario. I hitched a ride back to Kiyosato-cho, feasting on local cuisine before hopping on the train towards the volcanic hinterlands of Akan, the next pinnacle on my Hyakumeizan horizon. As I begin to melt snow, I notice the flame growing weaker with every passing flicker. “Oh, why didn’t I bring a full can of gas,” I scream, regretting my decision to wait until the last possible minute to pack. I’d brought one other canister, but could easily use that one just melting snow. The 3rd thorn on this unpredictable trip. Conserving as much fuel as possible, I manage to cook dinner and breakfast the next morning while melting enough snow to fill up my 2 liter platypus. Off to bed to dream about my impending ascent. “Damn cedar pollen!” These are the words that first came to mind after a long night of sniveling and sneezing. I left everything in my tent and stuffed my platypus, energy gel, and a few snacks in my bum bag for the 3 hour climb. The other climbing party had been drinking heavily the previous evening, so I had the peak all to myself. Following a clearly defined set of footprints, I clamber over half-buried trees before climbing up to the spur. The higher I climbed, the heavier my bag seemed to become and the wetter my back became. One quick inspection revealed that my platypus bottle had leaked over a liter of water into my pack. If I got any more thorns on this trip I’d surely turn into a rose. Low on water and drenched from the leakage, I pushed on. “Time to start eating snow,” I proclaimed, stuffing a handful of the frigid ice into my parched mouth. 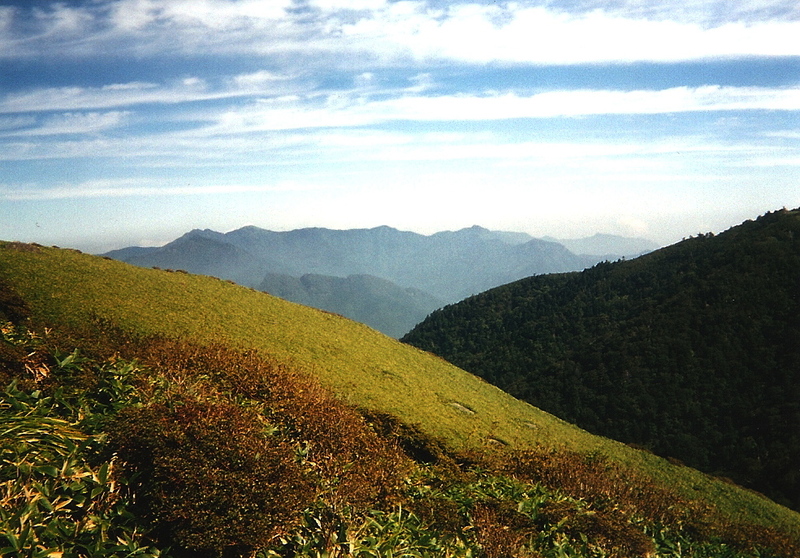 Upon reaching the spur, I was greeted with Hakusan’s brilliant edifice on my right, as well as a steep drop to a saddle before the final summit push of Mt. Oizuru. 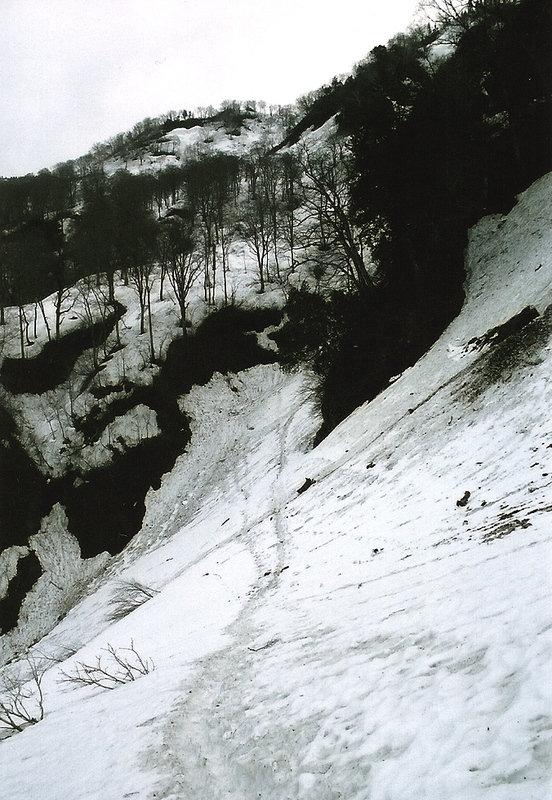 I slid down to the saddle, being careful to stay away from the gnarly cliff edges on my right. The final climb began: kick, step, kick, step, kick. At this rate I’d be lucky to make it up before dusk. Slowly but steadily I thought about what would happen if I gave up this far into my attempt. It was those thoughts that eventually landed me on top of the bald summit, where I collapsed and ate a late morning snack. 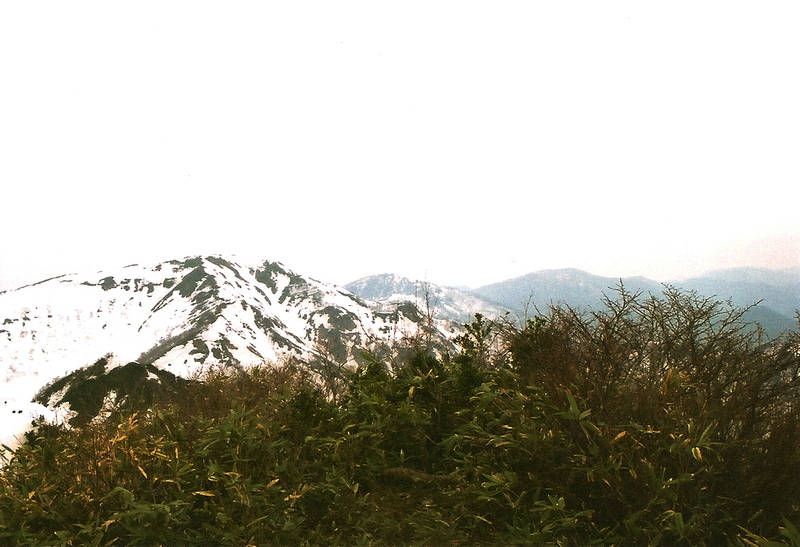 The Kita Alps and Mt. 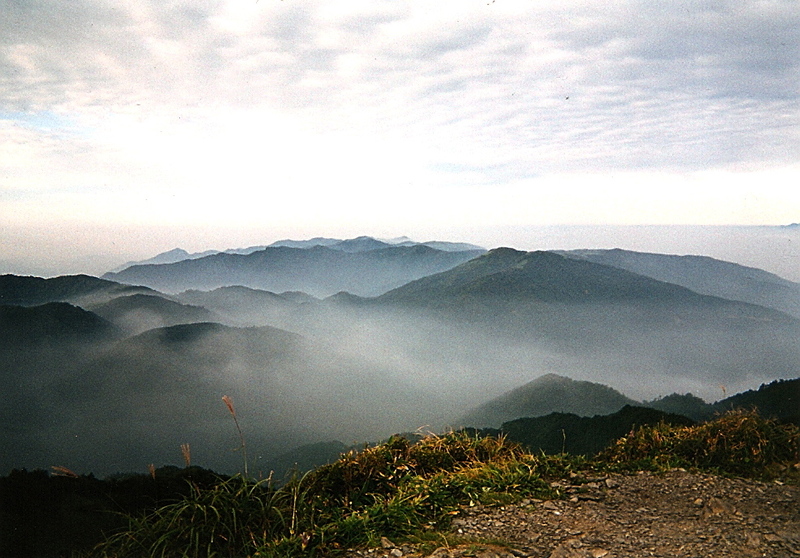 Norikura were clearly visible on the horizon, a blanket of haze between here and there. I retreated back the way I came, passing by my camping neighbors who’d gotten a much later start. I make it back to camp in time to cook up some noodles and melt some more snow. Luckily, I had a couple of PET bottles I could use in lieu of the torn water pouch. Refueled, I broke down camp and retreated to the steep valley far below. I’d had a hard enough time climbing up the ridiculously steep spur, but made my way down without any notable mishaps. Back at the parking lot, I spy a beautiful park across the street and quickly investigate. It looks like an amazing place to camp, with lush green grass and flowing river. “Best to set up camp after dark, just in case,” I mutter, opting for a visit to the nearby hot spring. I woke at dawn to the sound of screeching birds outside of my tent. Unzipping my tent fly to investigate, I am shocked to be surrounded by a pack of wild monkeys, chasing each other and foraging for food in the early morning light. Monkey claws and tent fabric don’t mix, so I did my best not to attract attention to my newly-bought tent. Fortunately, the creatures were more interested in playing in the trees and concrete suspension bridge than raiding my food supplies. I pack up my things and wait by the main road, thumb outstretched. After a half an hour of cars whizzing by, I notice two figures with abnormally large backpacks walking towards me from the other direction. 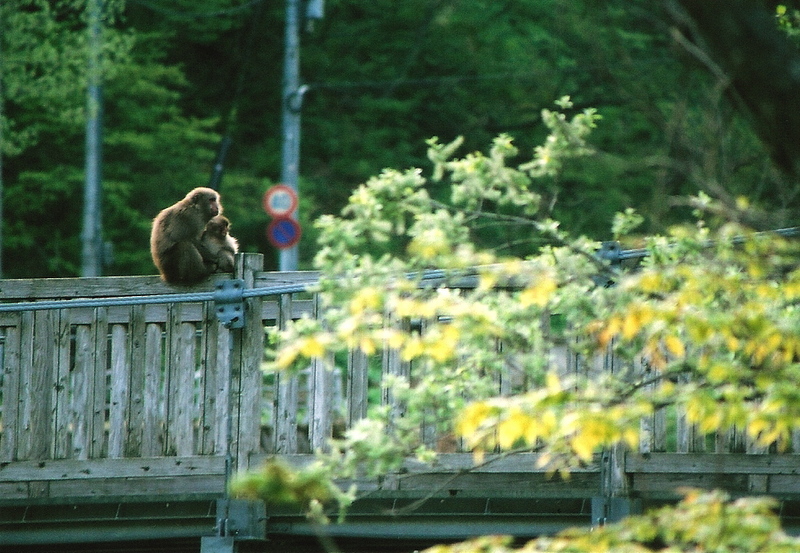 They’d just come down a monstrous ascent of Hakusan, and immediately offered me a ride. Along the way, we picked up another hiker and all went back to Kanazawa together. What an adventure this Golden Week has been, and I’m only on my second day. Little did I know that my adventure were about to become a lot more perilous on the steep slopes of Mt. Kongodo. Stay tuned…. 10 hours. If anyone ever asks you how long it takes from Wakkanai to Shiretoko by public transport, you now have an answer. Arriving at Kinoshita hut just as dusk was settling in, I cook up some food in the early evening glow and plot out my course for the following morning. The caretaker was quite a trip, jovially supplying answers to my non-stop search for information. 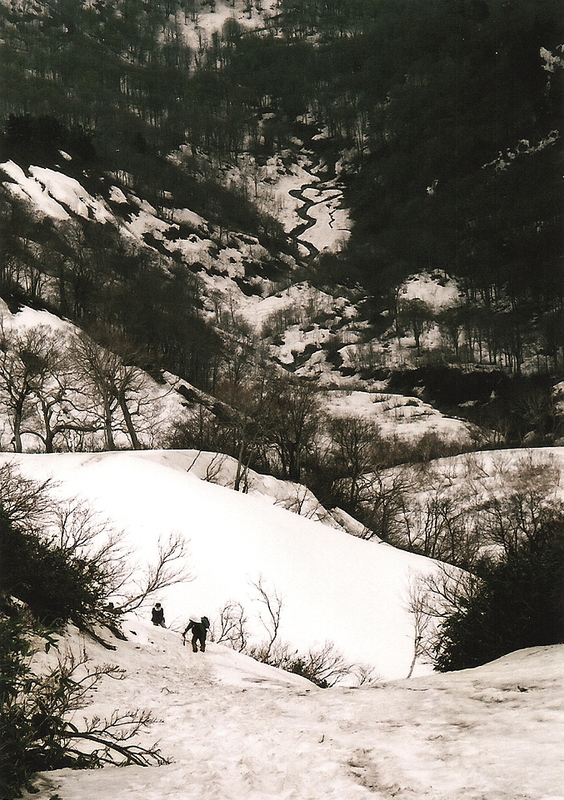 “The trail down from Iozan is closed to hikers, so you can’t do the traverse.” “Bear spray? You won’t need it. Just clap your hands and sing songs.” Quite a surprising piece of advice considering she just lost any potential revenue from rental of the aforementioned spray. The best part about the hut is the outdoor bath out back, as I made generous use in complete solitude while the rest of the early risers were off to sleep. Despite rising over a hour after the majority of the sloggers, I managed to overtake everyone only 30 minutes into the long ascent. I found myself all alone: the first one up on this beautiful August morning. My late start was intentional – I wanted others in front of me to scare all the bears away! Upon reaching Gokuraku-daira, my heart froze. “If there was ever a place for bears to call home, it would have to be here,” I muttered. My bear bell was utterly useless, so I took the caretakers advice and broke into the first song that came into my head: “Audiowhore, sucking on sound, sucking my voice, dragging me down.” Eric Bachmann’s lyrics never sounded so powerful. Once passing the ‘danger zone’, I shifted gears on the zig-zag ascent, popping out at Rausu-daira just in time to surprise a group of expats camping in the saddle. I pulled up a rock and spent the next 20 minutes or so swapping stories. It turned out they’d met Julian and his dog Hana on Mt. Poroshiri a few days prior. Tiny world we live in. I dropped my pack at their lovely campsite and raced to the rocky summit. 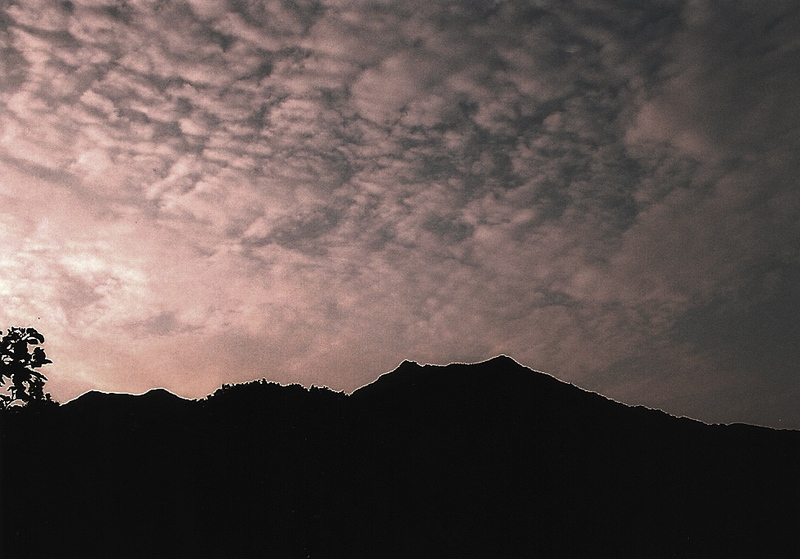 At one point I closed my eyes and slowly opened them, imagining myself climbing in the Japan Alps. Yellow paint marks, alpine flora, brush pine. Yep, the scenery was exactly the same, but 1500 meters lower in altitude. 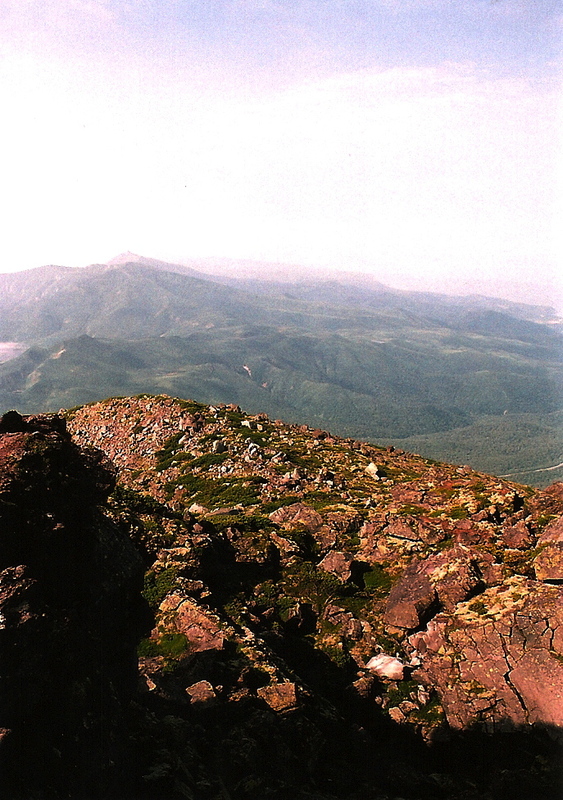 After a tough rock scramble, I pop up on the summit of #92 and sit, engulfed in stillness. Clouds drift endlessly over the Pacific Ocean, enveloping the Kuril islands and the mainland of Russia. Mt. Shari rises to the south, my target the following day. Meanwhile, the Sea of Okhotsk awakens from her slumber, revealing an endless line of fishing vessels and sightseeing boats. Retracing my steps to the saddle, I grab my pack, say farewell to my English-speaking companions, and retreat back to Iwaobetsu hot spring. On the return trip, I pass by groups of foreigners: Germans, Indians, and even an elderly couple out for an excursion. They all seem surprised at my early descent. A quick glance at the watch reveals a quarter past 10 in the morning. “Not bad for my 5:30 departure time”, I proclaim. Back at the trailhead, I scramble down to the lovely free outdoor baths near the parking lot, rewarding myself for making such great time. Shortly thereafter, I hitch a ride all the way to Kiyosato-cho, where Mt. Shari awaits. Would the dry weather streak hold out just one more day? With the heat of August behind me, I descend into the depths of Shikoku Island to explore the peaks towering over secluded Iya valley. My companion this time around was Bin-chan, a strong, witty Chinese girl who’d never been hiking in her life. Could she survive the 3-day, 25km journey unscathed? As the bus rolled into Tokushima station, we searched for a safe place on the busy street to hitch. Four rides and 7 grueling hours later, we find ourselves standing at the Kubo bus stop, trying to make a crucial decision about where to go. “No signposts or trailheads here,” I admit. The map offered few clues, so we opted to walk along the forest road directly ahead. After some inquiry with a few locals, we realized we’d have to continue walking along the road for well over an hour. “Let’s see how far we can make it before dusk,” I suggested, as Bin nodded in agreement. It was pushing 7pm when we finally found the trailhead proper, but without a flat place to pitch a tent, we ventured on. The orange glow on the horizon drew darker with each advancing step, but the headlamps soon made up for the lack of natural illumination. After an hour or so of heavy slogging through a cedar forest, we reached a trail junction, and the ridge which would be our home for the next two days. “Let’s camp here,” I suggested, pointing to a flat area right in the middle of the junction. We set up camp, ate a hastily prepared meal, and settled down to dream. 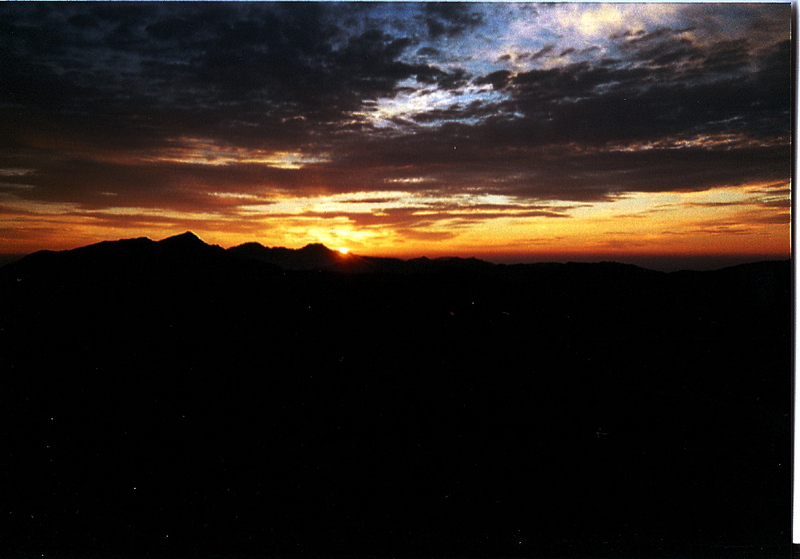 The next morning we were greeted with jaw-dropping panoramic views and a phenomenal sunrise. As we broke down camp, the early morning rays crept up directly behind our target peak, casting deep shadows in the serene valleys far below. 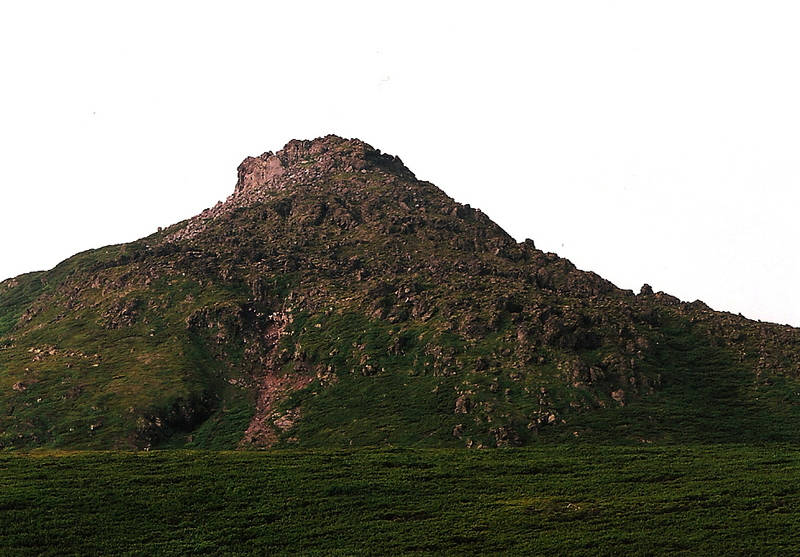 Layer upon layer of endless peaks spread out in all directions, culminating with the towering edifice of Mt. 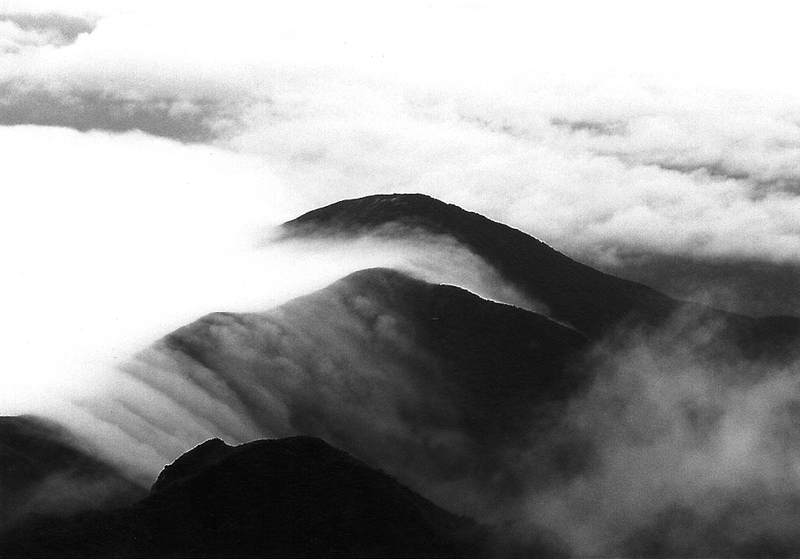 Ishizuchi soaring above the clouds. We headed for Mt. 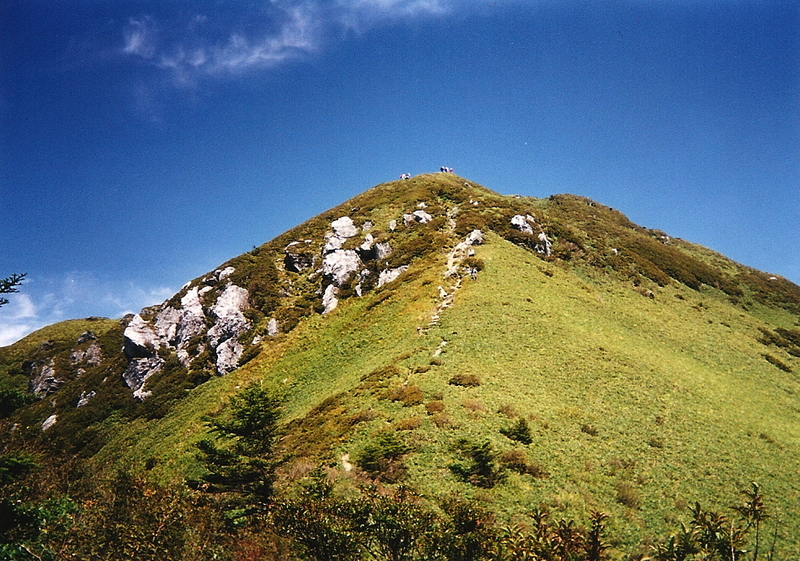 Miune, reaching its exposed peak about 2 hours later. We were joined by a few other early risers who’d ventured up from the emergency hut nearby. While most were heading back down into the immense valley, Bin and I pushed on, for we still had a full day’s worth of slogging before reaching our home for the night. The endless array of rolling hills gradually gave way to bamboo grass so dense we had a difficult time picking up the trail. Getting lost was the last thing on my mind, however, as I was petrified of stepping on a snake in the maze of undergrowth. Fingers crossed. After a long, hard battle, we finally reached the emergency hut just below Mt. Shiraga. Bin collapsed from exhaustion, and I didn’t have the heart to tell her we still had another 3 hours to go before reaching camp. “Wait here, and I’ll go get us some water”, I suggested, praying I’d be able to find the water source marked on the map. A half hour of frantic searching, followed by a steep trailblaze into a hidden ravine, and we were in business. 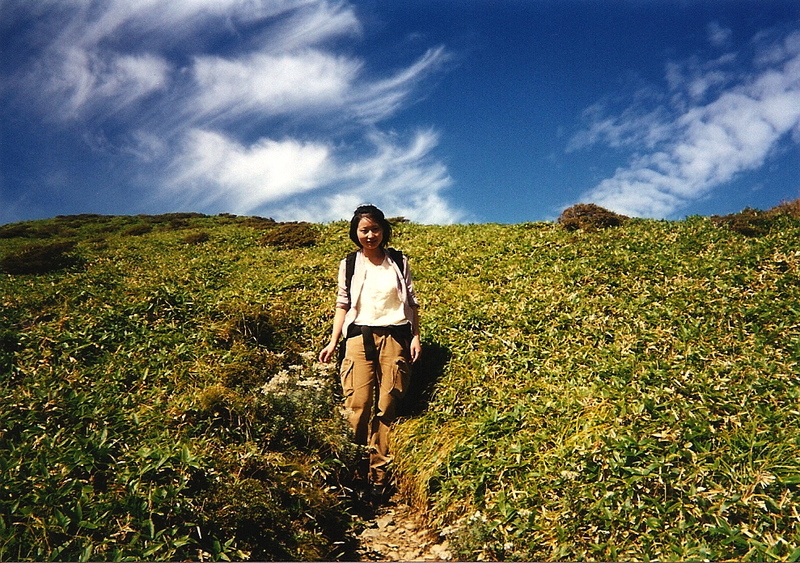 I roused Bin from her slumber and we slowly vertured on, arriving at Maruishi hut shortly before dusk. The hut was in immaculate condition and completely deserted, so we didn’t even bother putting up the tent. Early again we rose, blessed with yet another spectacular day. “Don’t worry,” I exclaimed, “Tsurugi is just over there”, pointing to the triangular peak on the horizon. Looks can definitely be deceiving, as we spent most of the morning on that all-too-familiar up/down monotony of ridge-walking in the hills. Our hard work eventually paid off, as we soon found ourselves on the final summit slog. The summit has definitely seen better days, and after 3 days of tough walking, both of us felt a tinge of disgust with all of the paved paths, shrines, and aesthetically-challenged structures. Quite a letdown after experiencing such pristine beauty. Finishing the rest of our provision, Bin and I descended to the massive parking lot and immediately hitched a ride back to civilization. My trusty companion was sore for a few days and had a nasty blister, but otherwise came out alright. Peak #15 in my seemingly endless quest to conquer the 100 mountains was conquered and with so many ranges still left to explore, I set my sights on Hakuba in hopes of scaling Mt. 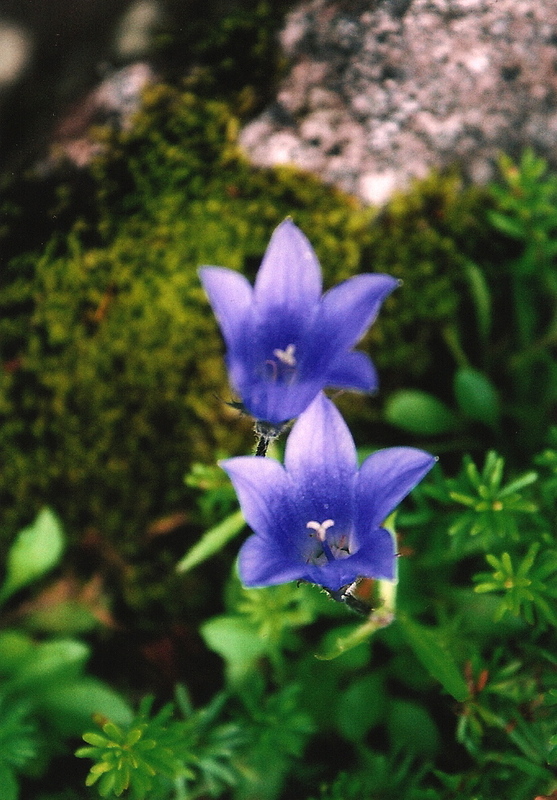 Shirouma before the onset of the winter snows.